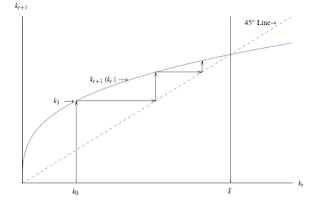 Nick Rowe's post on upward-sloping IS curves motivates today's musings. I'm sorry, but what follows is a tad on the wonkish side. It's intended mainly to promote a conversation with Nick. (You can look in if you want, but I'm sure most of you have better things to do on Christmas Eve!). 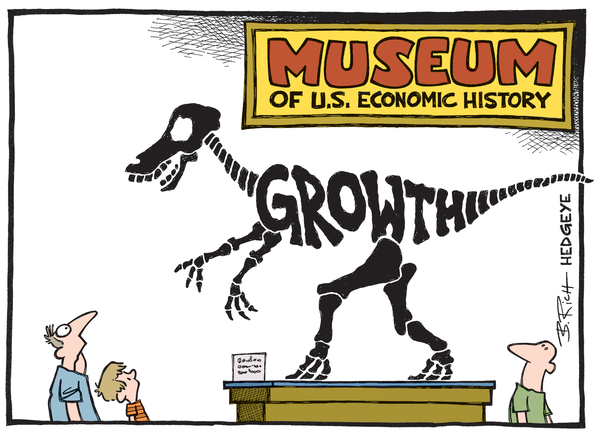 Consider the Solow growth model. Output (the real GDP) is produced with capital (K) and labor (N) according to a neoclassical aggregate production function Y = F(K,N). Define y = Y/N (output per worker) and k = K/N (capital-labor ratio). Define f(k) = F(K/N,1). Then y = f(k). 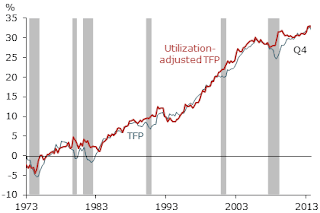 That is, output per worker is an increasing function of capital per worker. That is, the real wage is an increasing function of the capital-labor ratio (since labor becomes relatively scarce). The real rental rate for capital services is a decreasing function of the capital-labor ratio (since capital becomes relatively abundant). Now, consider an economy populated by two-period-lived overlapping generations. People enter the economy as youngsters, they become old, and then they exit the economy. The population of young people remains fixed at N over time t = 0,1,2,... The young are each endowed with one unit of labor, which they supply inelastically at the going wage. Hence, N represents labor supply. The young save all their income and consume only when they are old. Saving is used to finance investment, which adds to the future stock of productive capital. For simplicity, assume that capital depreciates fully after it is used in production. (None of the results below are sensitive to these simplifying assumptions). k(t+1) = (1 - a)f(k(t)) for t = 0,1,2,... with k(0) > 0 given (as an initial condition). The transition dynamics are such that k(t) converges monotonically to a steady-state satisfying k* = (1 - a)f(k*). The real interest rate at date t in this model is equal to the future (t+1) marginal product of capital (which is proportional to the average product of capital), R(t) = af(k(t+1)) = af((1 -a)y(t) ) / ((1-a)y(t) ). R(t) = af( (1-a)y(t) )/( (1-a)y(t) ). 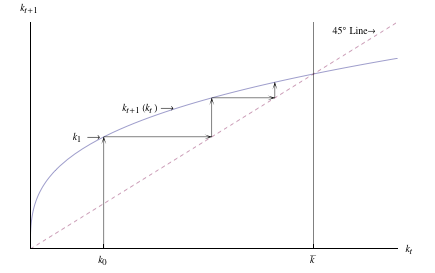 Equation  describes a conventional downward-sloping IS curve. A higher level of income (because of more abundant capital) increases desired saving, which puts downward pressure on the real interest rate. Conversely, an increase in the real interest rate reduces aggregate demand. Now, let's consider one of Nick's experiments. Begin in a steady state. Nick considers an exogenous 10% increase in the capital stock. I'll do the opposite experiment and consider a 10% decline. The capital-labor ratio is now lower. From , the effect is to lower the real wage and increase the rental rate. 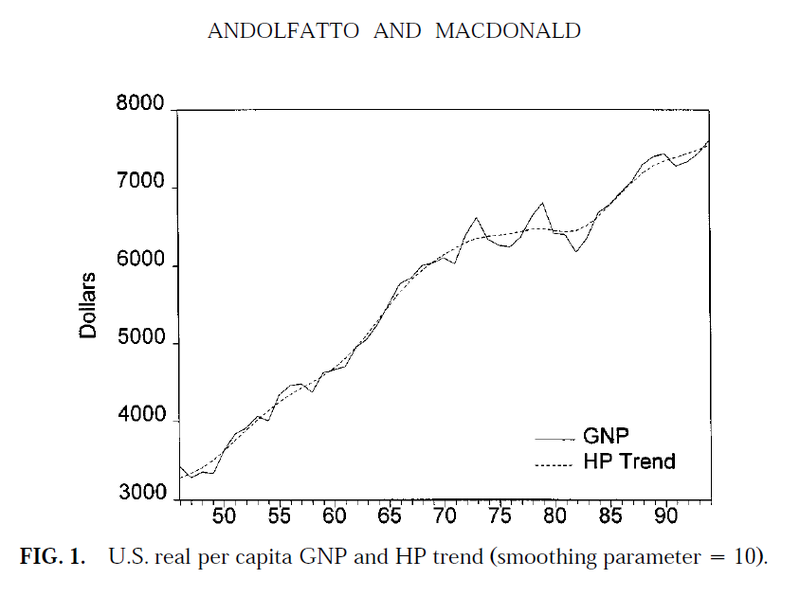 From its depressed level, the real wage increases monotonically back to its steady-state level. From its elevated level, the rental rate declines back to its steady-state level. The real interest rate, in turn, jumps up and then declines back to its steady-state level. In a competitive economy, these price adjustments reflect the underlying fundamentals. The shock renders capital scarce. Less capital depresses the demand for labor, which is reflected in a lower real wage. Capital scarcity means the the return to rebuilding the capital stock is high. As saving flows into capital spending, the scarcity diminishes, and the real interest rate falls back to normal levels. Next, to follow Nick's thought experiment in a slightly different way, suppose that a central bank tries to keep the real interest rate low in the face of the shock just described above. In fact, suppose that the central can manage to fix the real rental rate (hence the real interest rate) at its initial steady-state level forever. If r(t) = r* forever, then by  the capital-labor ratio must remain fixed for all t > 1. An implication of this policy is that the real wage will not fall. It's not that it cannot fall (it would fall if the real interest rate was permitted to rise). 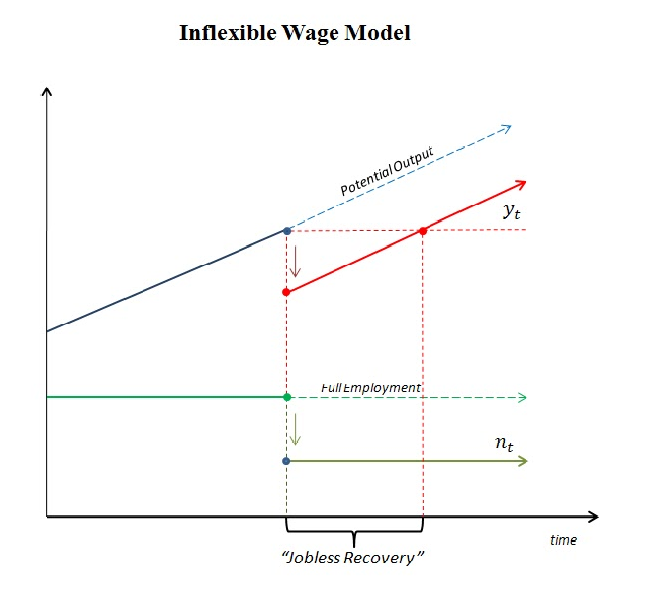 The real wage needs to fall, temporarily, to maintain full employment. But because it will not fall, then something else has to give. The level of employment must fall. Since k* = K/N is fixed and since K falls by 10%, it follows that N must fall by 10% as well. The central bank's refusal to permit the real interest rate to rise has led to an increase in unemployment (instead of a decrease in the real wage). How seriously to take this result? I'm not so sure. A lot depends on the nature of the shock that is imagined to have afflicted the economy. In the experiment considered above, I just wiped out a fraction of the economy's capital stock--like a hurricane, or nuclear bomb. A more generous interpretation is that the shock stands in for an event that evaporates a fraction of the value of existing capital (not necessarily its physical quantity). 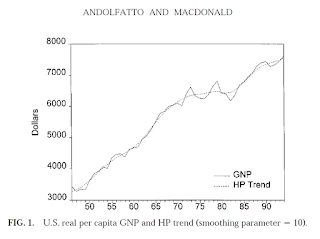 People do not become any more pessimistic in the model as a result of the shock, which is why the economy transitions back to its initial steady-state when the price-system is left unencumbered. A depressed economic outlook, on the other hand, would serve to reduce real interest rates, not increase them as in the experiment above--and that sort of scenario would provide more justification for low-interest policy. 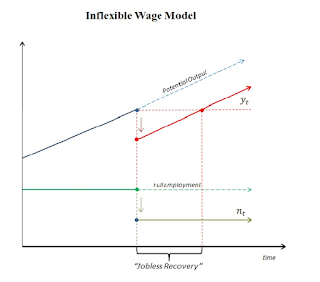 What is secular stagnation? The "secular" part suggests something that's persistent--in the order of decades (as opposed to the 2-5 year frequency usually associated with a business "cycle."). The "stagnation" part suggests a measure of under-performance. But what measure? Are we talking about lower than average growth in employment and incomes? Or are we talking about depressed levels, instead of depressed growth rates? Are we talking about both? Getting this straight makes a difference in how we want to approach thinking about the phenomenon in question. In what follows, I'll take the view that secular stagnation refers to prolonged episodes in which growth in real per capita income (GDP) is lower than its long-run average. Most economists agree that long-run growth in material living standards (real per capita income or consumption) is the product of technological progress. Contemporary business cycle models (at least, those used for monetary policy) assume that technological progress occurs more or less in a straight line. This abstraction may be fine for some purposes, but I never much liked it myself. As a PhD student, I was influenced by Schumpeter's 1939 masterpiece Business Cycles. It was this passage that led me to think of a model in which technological innovation drove growth but in a manner that was uneven because of diffusion lags. 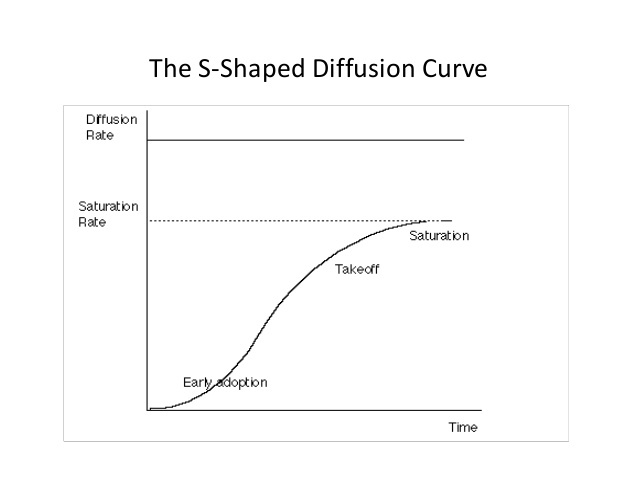 The notion that a new general purpose technology might spread like a contagion to generate the classic S-shaped diffusion pattern in GDP seemed like a very interesting hypothesis to investigate. 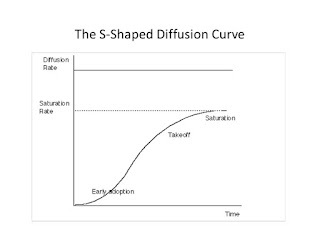 According to this interpretation, episodes of secular stagnation are largely an inevitable byproduct of the process of technological development and growth. Accepting such an interpretation does not, in itself, have any implications for the desirability of policy interventions. But it does call into question the efficacy of certain types of interventions. 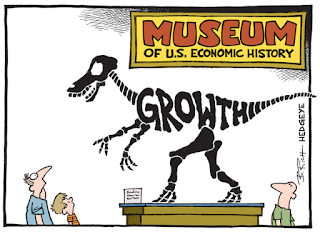 In particular, do we really believe that more QE will spur future economic growth? Or should policy attention be directed elsewhere? Now, one might object, as Larry Summers does here, that "If the dominant shock were slower productivity one might expect to see an increase in inflation." The type of reasoning that underpins this view is the simple Quantity Theory of Money equation: PY=VM. Ceteris paribus (holding MV fixed) a decrease in real income Y should induce an increase in the price level P. Maybe the 1970s provides the empirical basis for this view. But there is no theoretical reason to believe that productivity slowdowns, or indeed, expected productivity slowdowns, should be inflationary. It's very easy to demonstrate, in fact, that "bad news" in the form of a slowdown in productivity leading to depressed expectations over the net return to capital spending can cause a "flight to safety" to government debt instruments (including money). The effect of such portfolio substitution is to depress bond yields and the price-level (see here and here for example). 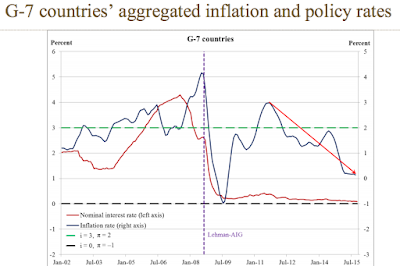 But even apart from these effects, the behavior of inflation depends critically on the nature of monetary and fiscal policy. 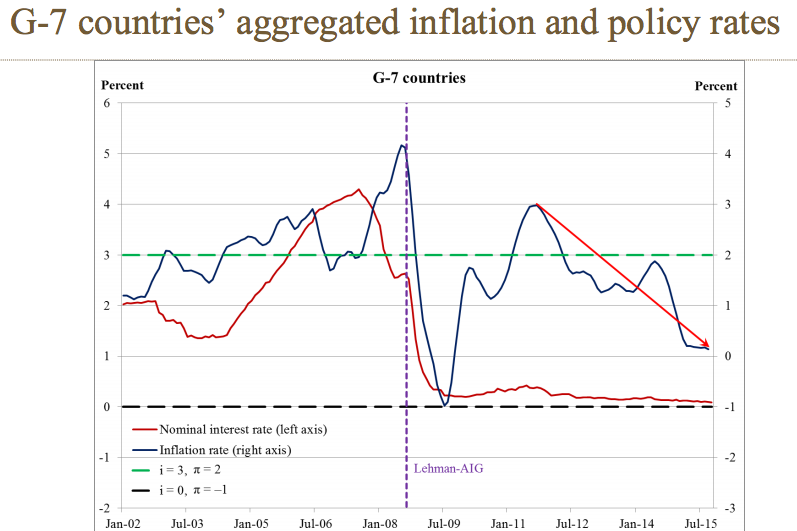 Of course, the conventional view is that raising the policy interest rate will cause inflation to go down, not up. The idea that the opposite might be true is evidently something to be ridiculed. Wonder why world is in a mess? 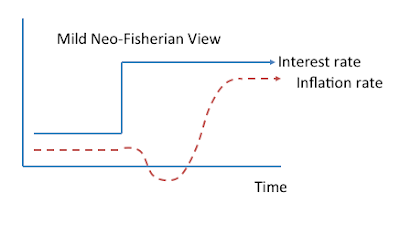 Neo Fisherians: ”lowering rates causes inflation to slow down & raising rates causes inflation to speed up." I can't help but think that Pettifor's view on the proposition was formed without first trying to understand it's underlying logic (but I could be wrong). Also note that the proposition is not inconsistent a higher interest rate leading to lower inflation in the short-run. Neo-Fisherism has theoretical elegance but lacks intuitive logic. At its heart, neo-Fisherism says there is, somewhere, a fixed real rate that drives what the public expects inflation to be. Yet few people–even those who know what real rates are–have a firm view of what they should be. Their expectations of inflation are more likely to depend on past inflation, central bank or private forecasts, and the state of the economy. These expectations of inflation will then drive the returns they expect on saving and investment, not vice-versa. The first strain of the theory seems to rely entirely on rational expectations and the Fisher equation (without any reference to central bank balance sheets or the conduct of fiscal policy). The way this thinking goes is that the Fisher equation is just a no-arbitrage-condition. (No-arbitrage-conditions are compelling economic restrictions because if they did not hold, traders could make infinite riskless profits.) If a central bank raises the nominal interest rate, then for a given real rate of interest, the expected inflation rate must rise (else traders will be making infinite profits). This seems to be the interpretation favored by Stephanie Schmitt-Grohe and Martin Uribe (see my discussion here). Intuitively, think of the following thought experiment. The Fed raises its policy rate and its widely expected to remain at this elevated level for the foreseeable future. The effect of this policy is to increase the carrying cost of debt for the government. Assume that the government services this higher debt burden not by cutting expenditures or increasing taxes, but by increasing the rate of growth of its nominal debt. Essentially, the government is printing "money" to finance interest payments on its debt. Then (assuming a constant long-run money-to-debt ratio) the money supply must start growing at this higher rate. Suppose that people generally understand this (a big supposition, I know). Then, people should revise their inflation expectations upward (and actual inflation should result, not because of inflation expectations, but because the monetary and fiscal authorities are printing nominal liabilities at a more rapid pace to finance the higher interest cost). Impressive how quickly congress has stopped caring about the deficit even as the end of ZIRP means it actually might make sense to care. Impressive indeed. But if interest rates on U.S. treasury debt continue to rise, the debt-service problem will make the headlines soon enough. The debate will then turn to whether the U.S. should cut G and increase T (austerity) or permit more rapid debt expansion (and inflation).